The cast of the History Theatre’s Lord Gordon Gordon. Photo by Scott Pakudaitis. A fast moving evening of comedy and song awaits all who attend Lord Gordon Gordon (the name repetition is not a typo) at the History Theatre. It is the third collaboration between Jeffrey Hatcher (who wrote the book) and Chan Poling (who wrote the music and lyrics). This is the team that previously created the superb Glensheen and the disappointing Night on Olympus. Their latest creation is definitely in the win column, but could use some tweaking to bring it up to the level of Glensheen. Director Ron Peluso directs a splendid cast that never leaves the audience bored. Lord is about an actual 19th-century con man known as Lord Gordon Gordon. Little is known about the man, other than a few details about a couple of his cons and his death; Hatcher and Poling’s response was to write a speculative biography. Gordon (Mark Benninghofen) came to Minnesota in 1891 and presented himself as a wealthy Scottish lord (kilts and all) interested in buying land from the railroad that encompassed close to half the state. His successful con sold a story of Gordon bringing 60,000 Scottish immigrant farmers to a state still dominated by railroad interests. The result? Many prominent business leaders invested money to secure shop space in the new towns they thought would be set up. A scene from Lord Gordon Gordon. Photo by Scott Pakudaitis. In the musical, Minnesotans are ecstatic at the thought of such an influx of farmer immigrants (imagine a time when immigration was desired by all). Gordon takes his victim’s money and promises to return. Instead, however, he takes the train to New York City with plans to abscond to South America with the money and his accomplice (Adam Qualls). On the train ride, Gordon has a tryst with Sarah Belden (Jennifer Baldwin Peden). Sarah is the wife of a New York stock broker named William Belden (Eric Morris) who, like a pimp, readily accommodates his wife sleeping with others if it advances his own investments and cons. Gordon and Sarah fall in love, setting up Gordon deciding to help her get revenge on railroad titan Jay Gould (Randy Schmeling). This leads to his undoing; before the show is done, we see both Canadian Mounties and the Minnesota militia on the verge of going to war because of Gordon. Act I proceeds as a quick but steady pace. Act II has so much action that, at times, it is hard to keep track of what is going on; the audience would benefit from a more even pace, fewer events, and more detail. The highlight of the second half is a scene where Gordon attends the opera in New York. While Gordon and William Belden are verbally jousting, we see in the background the ensemble’s hysterical rendition of an opera in three different languages. The very stylized ending is also a highlight. Benninghofen is superb as a laidback but lonely con man. Peden’s Sarah makes for a tragic figure, which renders Gordon’s love for her very believable. The other actors play both individual roles and make up the always present ensemble including Gary Briggle, Jim Ramlet, Katie Morris, and Jen Maren. 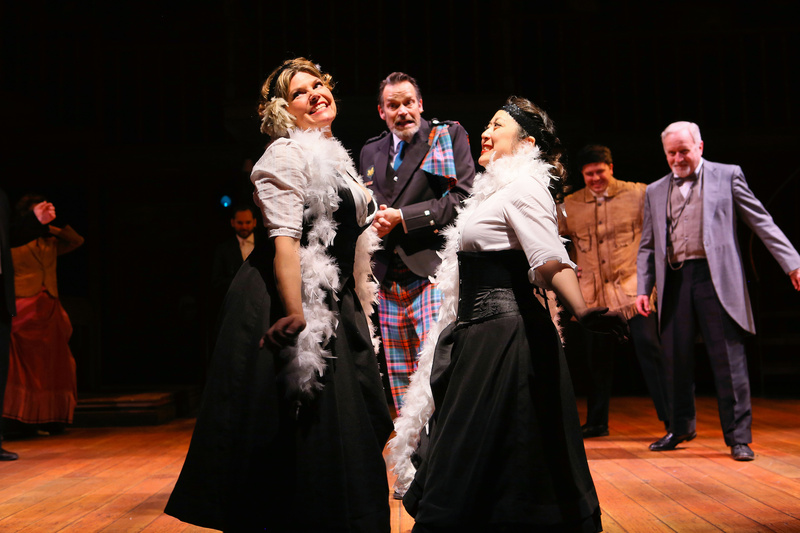 It is this energetic ensemble that, as in Glensheen, keeps this show moving so there is never a dull moment. There are several delightful scenes, but by far the best is when the ensemble – in reggae style – sings and dances to the song “Sixty Thousand Scots”. Another scene from Lord Gordon Gordon. Photo by Scott Pakudaitis. Eli Sherlock’s scenic design provides an almost cartoonish version of a Minnesota frontier town that is cleverly modified to become a train, a New York opera house, and a Canadian prison. Barry Browning’s lighting design swiftly moves the show from scene to scene. Abbee Warmboe’s prop designs, including the train and the horses, are both clever and contribute to the show’s humor. Andrew Fleser’s musical direction of the five musicians blends in perfectly with the action and adeptly supports the performers. Lord is an entertaining romp that makes for a delightful summer show. 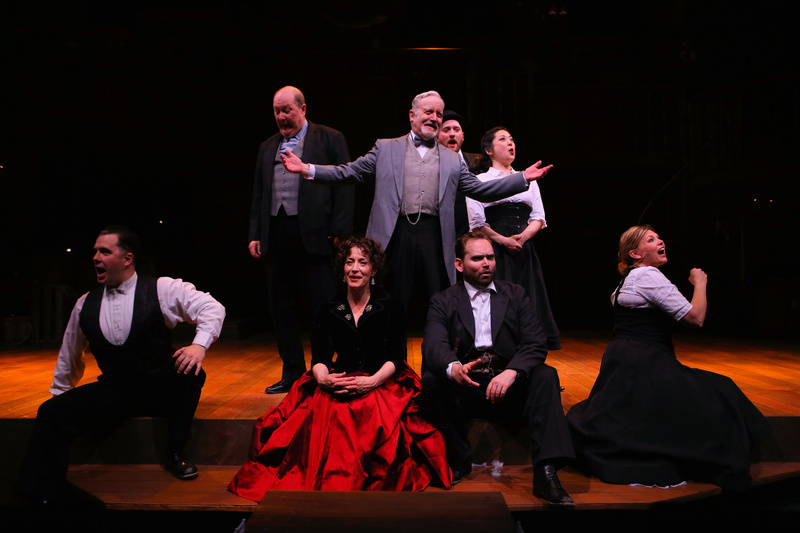 Lord Gordon Gordon plays at the History Theatre in St. Paul, MN through June 3.